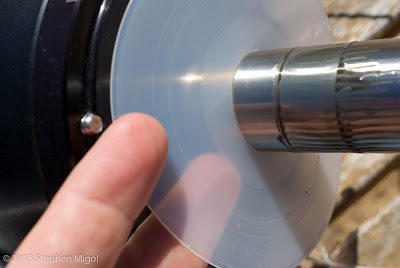 While I was pulling the scope on and off the mount recently for the purposes of flocking, I noticed that even with the body of the camera secured with the tripod socket, it still moved when handled. This is not good! Obviously a source of flexure, I was wondering how this could still be the case given all the work I'd put into securing things. Thinking about the mechanics, all that is secured by the tripod mount is the Roll of the camera. Pitch is only slightly controlled and Yaw is also slightly controlled. Looking at the way the image stacks add up over time, I can say that since nearly all movement is in RA, the Pitch is a major culprit. Continuing thinking of the way the camera is constructed, I considered what could further reduce the potential flex. 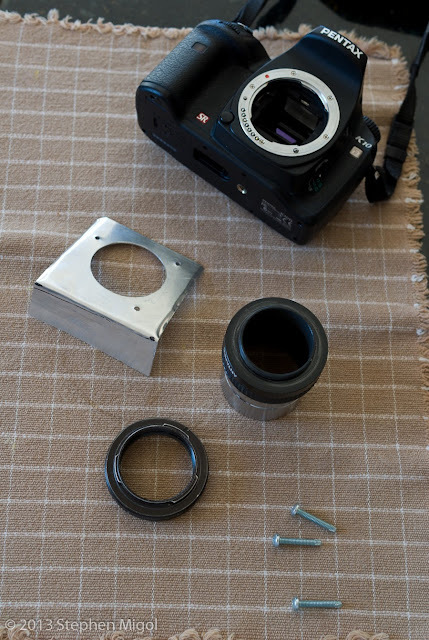 I know that the kmount and flange and mirror box all are one unit that connects to the metal chassis of the camera. Since I haven't had the camera apart myself, I don't know how much is metal. Still, there's a fair amount of rigidity in the body due to this skeleton. I'd seen a product online that was a Tmount for a Canon camera that had Pitch and Yaw screws that would press against the surface of the camera. The idea was that they would take up the slack in the mount flange springs, holding the camera body tightly to the lens. Of course, no one makes a Pentax version. So I figured I'd make one on my own. I got 1mm thick aluminum stock. Would have preferred brass, but Al was cheap and easy to work. Drilled a 1.75 inch hole in the metal and deburred it. This fits perfectly over the 42mm T thread of the flattener. Allowing a little bit of flange for putting some machine screws through the metal, I then bent the edges of the metal to give a little stiffness. I would have put the screws on equal thirds around the mount, but there's not enough of a shoulder to allow this position. Also, the lens release button is in the way! Everything all put together makes for a slick device. I did have some challenges with mounting it on the telescope. The tripod socket configuration I had in place before wouldn't work anymore. The spacing wasn't enough and the parts wouldn't clear each other. 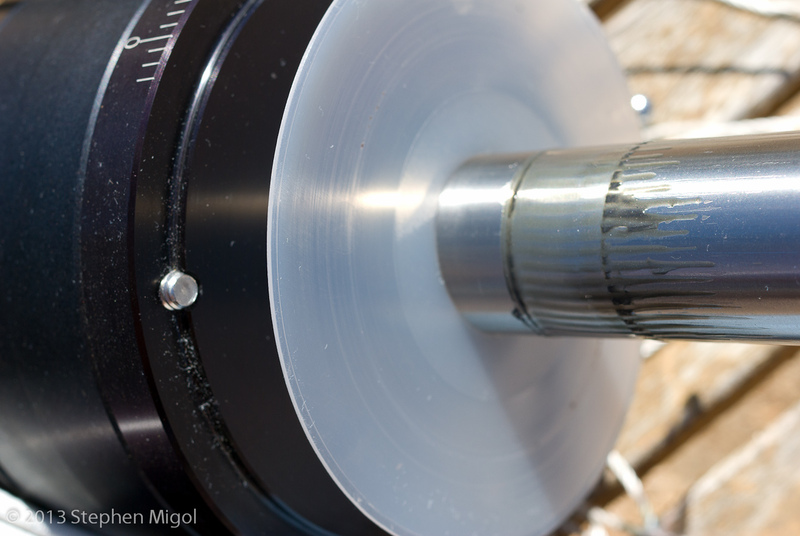 Also, with the machine screws tightened up, the focuser, flattener, and camera wouldn't line up with the dovetail bar. In the pictures above, you can see how the holes clear the space around the Tmount. In this case, the Antares 2 inch adapter is pretty wide, but it still clears underneath. 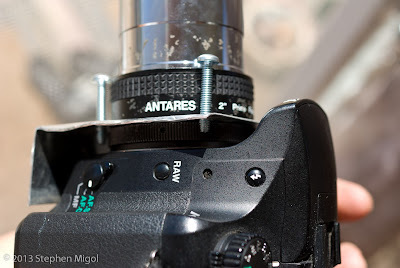 The self-tapping machine screws press on the edge of the metal flange of the lens mount when they are screwed down. I could measure how much gap is appearing along the edge for the purposes of centering or leveling. That may be an exercise I'll have to do before going to CalStar. That was annoying to have to ditch one method of securing the camera over another. I can always undo this effort if it seems to not work. Another thing I noticed was that the Feathertouch focuser was loose on the body of the scope! Just a quick snug of the grub screws was needed. I think the heat cycle of being outside in the sun probably worked them loose. This would likely explain why focus was lost over the course of one session a few days ago. This is how the RA pad looks under sunlight. Note how it is translucent and there's clear evidence of pressure marks over time. Even though the pad was completely dry, I still think this is a major culprit for the slippage I'm seeing in RA. I swapped it with the DEC pad which didn't have this look. It was also a thicker pad! I'm ordering a new set of pads. Update: After doing this change, I ran the mount last night and was disappointed to see that nothing really changed. Will try again and see what I find. Interesting things that I've learned over the years for calibrating astro-images with my Pentax K10D camera. The Pentax K10D camera is an older design, released back in 2006 when Pentax was an independent company. Since then, it has passed through the hands of Hoya and now is a part of Hitachi. I'm not sure of what will happen with the Pentax name, but for now, it remains an independent brand. 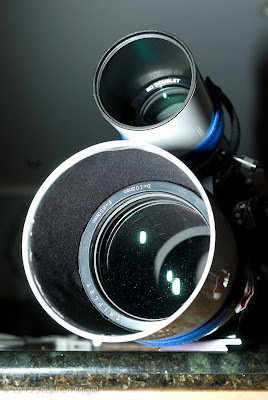 As some context for why I'm using Pentax for my astrophotos, the short answer is "use what you have." The long answer is that I already had an investment in old glass and wanted to continue to use it. Over time, I've learned a number of things about flats. Back at the start, I used the method described by DSS to create flats. I did everything from t-shirt flats on a sunny day to twilight flats to flats pointing at a computer monitor. I also reused the flats from session to session, believing that any rotation issues would not show up. Eventually, I realized that reusing flats wasn't a practical thing to do and that I was doing a disservice to my efforts. I saw how dust motes were cropping up and were uncontrolled in my bad habits. I saw a post on Cloudynights where Rob (pfile) noted where he'd seen a page from a photographer that removed the mirror from their Canon camera in an effort to control vignette. The interesting thing is that their flats seem to greatly mirror the effect that I see with my Pentax camera. The vignette is not as strong as the Canon, probably because Pentax's Shake Reduction system requires a bigger mirror box. I'm not prepared to make this modification yet. However, I may get to it eventually, especially if I ever get another camera body for IR use. 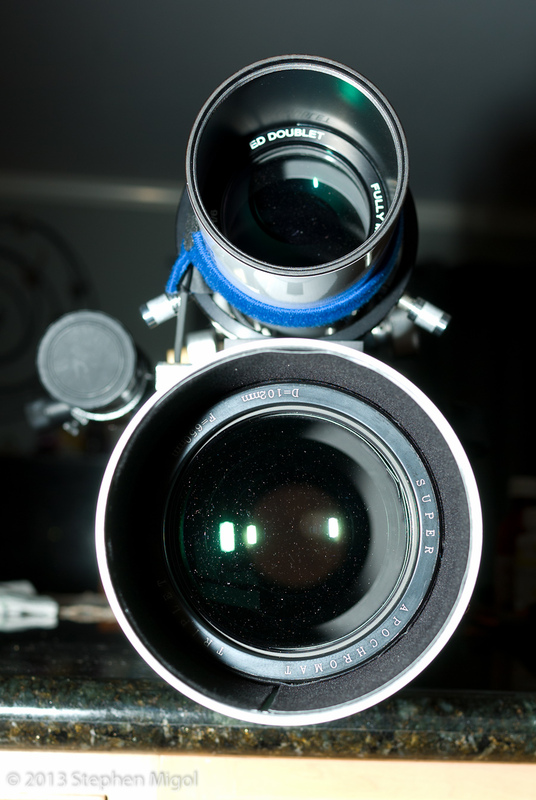 Here's a video of the K10D in bulb mode for reference and to see what the relative size of the mirror boxes are. 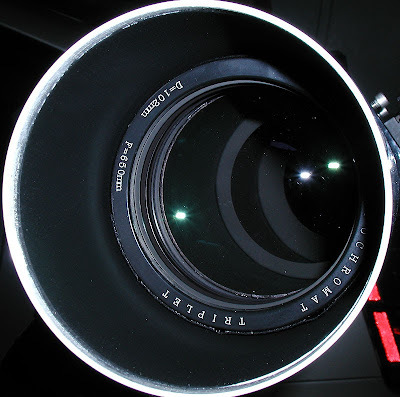 Before I actually consider doing a mod to the camera, I would like to work on centering the camera to the telescope. Another thing I've noticed is that even with the flocking of the flattener and other work, I still see off-axis reflections. I noticed last night when imaging IC1396 that Akaris created a bright spike into the frame. I think that there is something inside the scope that is setting up a reflection. I looked down the throat of the telescope under intense daylight and was pleased to see no light coming in. This means that any remaining light leaks are in the camera body. Most likely at the dremel hole for the finger. Time to wrap up the camera body with a sock! Also while looking, I saw that the feathertouch focuser has exposed baffles that are bright and shiny. These should be covered with a flat material. I'm not sure if there's enough clearance in the drawtube to allow the flocking paper to be used. I'll try pulling the focuser and lining it next week. Last month I was using the modified camera in the back yard and I did something kinda lame. I wanted to secure the thermostat dial and made the smart move of tucking it into the fins of the heat sink. Eventually, the thermostat blocked the fan blades and kept the whole thing from keeping itself cool. Ugh. I didn't notice it until I smelled hot plastic. It was the closed cell foam melting. I was sure that I'd killed the device. It still works just fine. Maybe I aged it a little aggressively and it won't do as good of a job of cooling, but it seems to still work pretty well at getting the camera cold. There's no frost forming - not that there would be in the summer and there's actually very little exposed metal from the finger. There is still a lot of condensation that appears on the bottom of the camera body. That's likely a place I may want to put more insulation. I finally pulled the heatsink fan off the system yesterday in a desire to inspect the system and see if it needed more thermal compound. Everything actually looked really good. I did clean up the compound and added replacement material. Maybe not enough, but it should do the job. Still to be done is to open up the base of the camera and add thermal compound to the junction with the metal inside the chassis. I also want to add some insulating foam in some tight spots. They may also be places where light leaks appear. Speaking of light leaks, I found that the connector area where the power and USB connections enter is a place where light can enter the camera body. Not sure how long this has been happening. I'll want to make something a little more permanent than what I have now. Or I could go back to the old sock method where I wrap things up in an old sock to provide insulation, too. 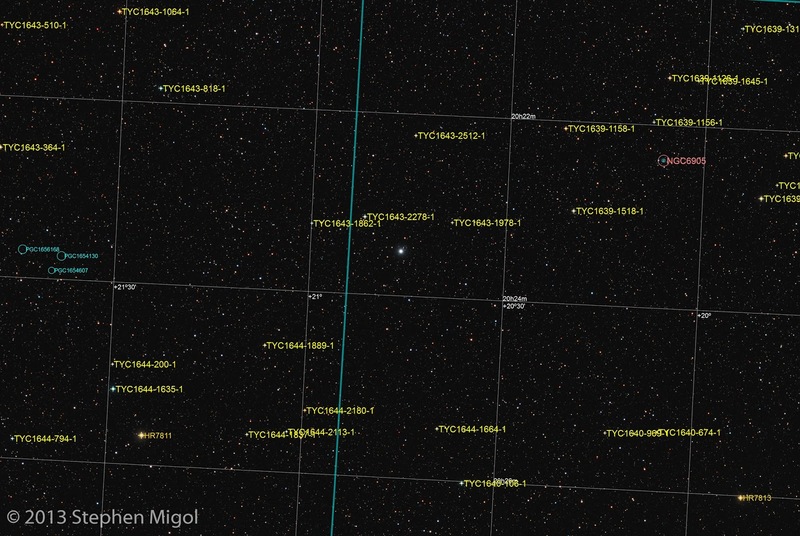 There's a new nova visible - found just two days ago. It's still growing in brightness and at just about 6th manitude, it may become naked-eye visible soon. I found the reference to the nova from a facebook post and then since I still had my gear set up from the Iris work, it was easy to try to get a few subs of the target. 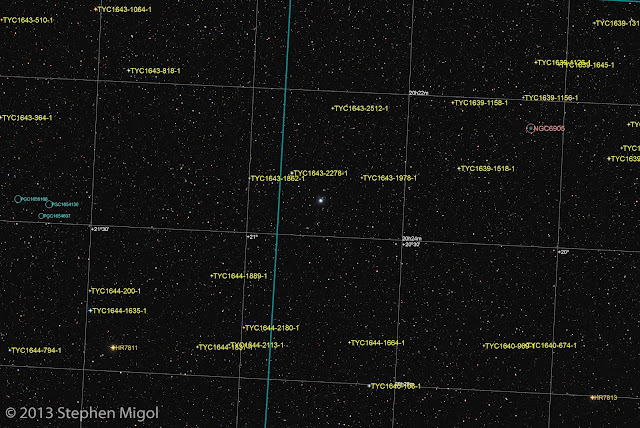 The location is RA 20 23 31 DEC 20 46 04, near NGC 6905 (a nice planetary nebula). The session was just three subs of 1200 seconds (my standard length). I calibrated with a bunch of darks at 17C using a newly modified hot pixel mask in Maxim. The PI process is much what Mike's Astronomy Page suggests. I actually used the instructions noted by Manuel Jimenez a little blindly. I learned a lot about what I can do and look forward to trying the process on the Iris project. A single subexposure from a project I'm working on at the moment. This shows all I've gotten so far from the current meteor shower. Not much to see! Note the slight blue marks at the top of the frame. These are artifacts from calibration of improper amp glow removal. Means that there's something not quite matching in the dark vs light. Probably a real temperature difference vs the EXIF temperature. Will try calibrating with a range. This was calibrated with Maxim using a library of darks that have been recently captured -- within the beginning of the month. Pix Insight was used to color calibrate, histogram stretch, and curves applied to drive the background a little darker. No other processing used since this was a single image. The bubbles in the G11 mount are offset. Centering the bubble is not level. Instead, it's best to have the edge of the bubble touch one of the lines. Maybe this is the intended function. Taking the step of measuring the tripod using a mason's level shows the evidence. Level across Azimuth. It's actually not level here, only slightly off. is due to uneven heating of the legs by sunlight. What has this meant? It means that polar alignment is a much easier task now since the Azimuth and Altitude adjustments don't throw each other off as much. I was able to identify that the difference in drift when viewing east and west was mainly due to viewing stars that were too low in the sky and not equal in altitude to each other. In a follow up effort, I found that using stars that were at 40 degrees elevation -- nearly the same as the pole -- the V shape matched. By following these steps, I was able to get a Gemini model that was pretty good! By reading the notes at http://canburytech.net/DriftAlign/DriftAlign_2.html I was able to confirm that I will not be able to get better than 1 arc minute accuracy in ALT due to refraction. The refracted pole (which is what is measured in drift alignment) will always appear 1 arc minute too high. This is not a problem for most of the sky. 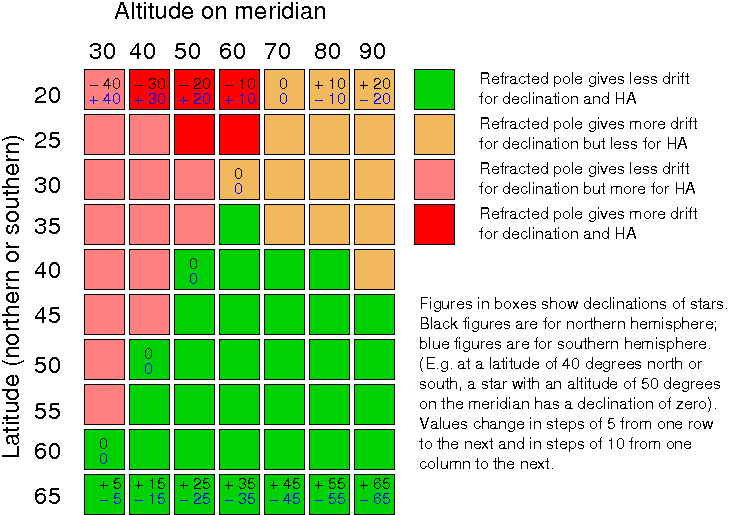 So long as I image between 40 and 80 degrees altitude on the meridian (which is most of the interesting targets), it will be a non-issue. Outside of these thresholds and the tracking will suffer. I should turn on King rate at those points. Last night I did some polar alignment by using the drift method and the DSLR with timed exposures. By the combination of these 2 minute exposures and a quick preview in Maxim with watching the adjustments in the finderscope by eye, I can readily see the corrections made. Last night, I left the alignment very good when the scope was pointed to the west. Tonight, I checked the east and was surprised that it was out of alignment! I adjusted the ALT and then checked in the west. It was now out of alignment! Puzzled, I thought about how this could be happening. The error seems to be from the RA axis sagging depending on which side the scope is positioned. I tighted the bolts holding the DEC axis in place -- they needed a touching up -- and tightened the legs, which also had slightly loosened. The symptom was that when the scope was pointing east, the RA axis was pointed too high. It was reverse (apparently by the same amount) when pointing the other direction. I'm wondering about the condition of the ground. Maybe when I come back from my trip I'll put some concrete pads under the legs. I'll need to flatten the ground underneath the pads and pound the soil somehow to make it more firm. I was thinking some more about this problem and I considered if the ground was sagging, then the RA axis would be too low on either side. This is not the case. It appears to be too high when looking east and too low when looking west. The current culprit may be the RA Spacer. When I put that on, I didn't take special care to center it. The level of centering required is beyond my ability to hand-hold the parts. I'd need a mandrel to slide down the shaft and hold it centered. That might end up being the final solution. In the meantime, I'll have to make do with trying to center the deflection. To this end, I flipped the RA upside down (no weight and no telescope) and then loosened all the bolts holding the spacer. This allowed the whole device to float - and I could see that there was some movement. While it was hanging upside down, I gently supported the system and tightened the bolts. If I were to ever get my hands on a centering mandrel of the sort I'd need, I would do the same procedure. I'd need to remove the DEC axis and the polar scope to have a clear shot through the mount. I worked on the spacer again, this time using a metal straight edge to ensure near-identical space on either side of the axis. Not able to do this for a vertical centering, though. The more I think about this offset issue, the less I believe that it's an issue. As a straight offset, the off-centered position just acts the same as a guidescope does vs a main scope. They still rotate about the same axis. What is the situation with AZIMUTH? Does it also vary? Rotate the RA by 90 degrees by removing the bolts and spinning the RA axis. If the error shifts, then it's an RA axis issue. It may still be an issue with the ground settling under the tripod legs. I do know that the ground will shift as I walk around the scope. Putting the legs on concrete pads may not do anything. It's still easy to check. I did check whether the weight under each tripod leg changes as the scope changes position. The shift in the center of gravity didn't seem to matter and using a scale shows it. The weight under one leg was 41.5 lbs with a variance of .5 lbs when the scope was slewing. Not much of a difference and it didn't seem to corroborate the deflection. I did notice that one leg was sitting partly on grass and the red mesh material rather than sitting directly on the ground. Putting the tripod on a concrete pad will be a good idea. Continuing the good weather, I wanted to capture a few more points that would help when going back to my notes. I've done PEC training at .2 x RA tracking. Drift analysis at this rate is unproductive. The estimates keep wandering around and don't get any better. It's interesting how the .5 x rate was so good at approaching an optimum value. The reason why I wanted to use the slower rate is that the tracking and RMS values at .2x are significantly better than .5 x. For example, at the higher rate, I see RMS values that are no less than .5 pixels and mostly about .7 pixels. It's possible that the sensitivity and aggressiveness are too high, or it could be that the durations of movements are too slow to be properly handled by the computer. When using the .2x rate, I get consistently good RMS values. Look at this graph of 15 minutes of tracking at 2 second exposures near IC 5070 (Pelican Nebula). Notice that the scale is set in pixels. The RMS trend is very good. The periodic bumps in DEC are due to polar alignment issues. I see 4 areas of corrections that are problematic as the mount appears to not want to move. I would like to revisit the polar alignment when the marine layer cooperates and see what is happening here. Back to the PEC topic, the .2x rate curve was similar to the .5x curve. I did the same method as before: sampled at .5 seconds with a delay of .5 seconds (giving samples every 1 second). A primary curve was used and then a second run was used to modify the curve. 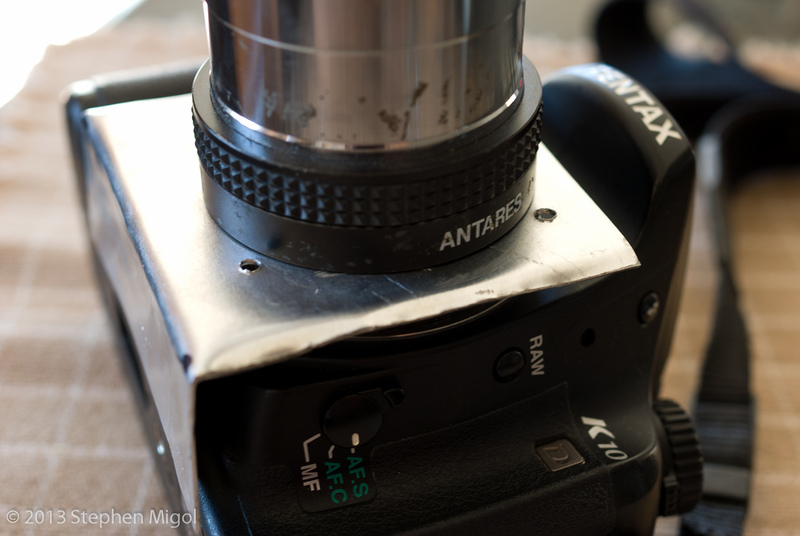 Note, I must INVERT the curve when uploading to the mount, otherwise it does not work properly. The first curve is inverted, the second curve is ADDED to the first, and that result is then uploaded. At this point, I'm happy with the results on the PEC. There hasn't been much good weather for as long as I'd prefer to be able to do rigorous testing. Last night, the clouds came in at 10 pm. 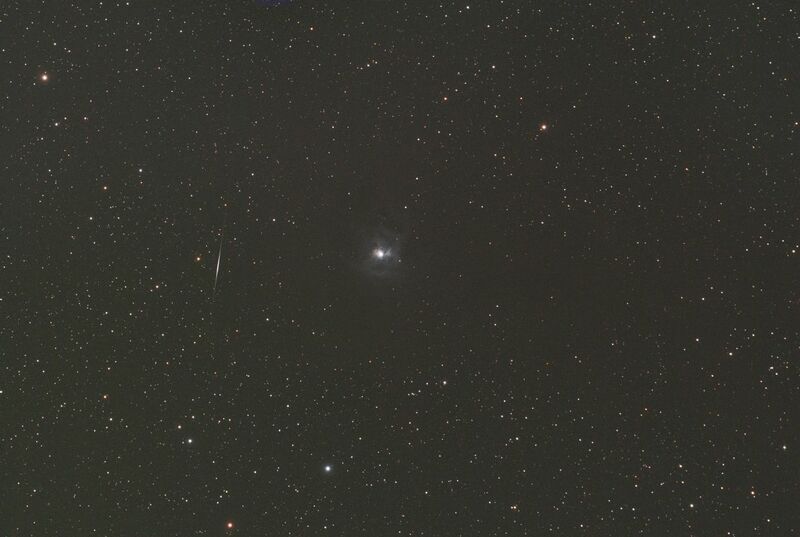 The night before, I was only able to get 2 images done - not enough to do real testing. This session was the source of the above graph. Thoughts: Alignmaster may be a good system to use now that the cables are not an issue. Could be used with the RACI finder. The Gemini 2 tool of PAC seems to work well, but needs at least 4 good star alignments to give results (plus a slew to the appropriate part of the sky). Lastly, finding the ideal DEC backlash setting is a problem for both systems. I'll revisit when I get the chance. I checked balance on the scope assembly and I see why the .2x drift refinement was not working well. It was happening at a point where the balance was too even. There was minimal to no east bias at the place where the script was running. I've changed the position of the counterbalance weight, added some marking tape, and upgraded the plumb weight to 11 lbs from 7 lbs. Seems a bit overkill, but it works to make the system consistent across the whole range of motion. Will try drift analysis tonight if the weather cooperates. Also, I looked down the business end of the scope under daylight conditions and was intrigued that there were more light leaks visible. The feathertouch focuser has a tiny line of open, unbaffled tube. The amount of light ingress was minimal and also was not directed towards the camera sensor. Still, it may provide some reduction of contrast. It is most certainly the place where light can enter when taking darks during the daytime. I solved this problem with the old sock method: I wrapped the focuser tube with an old sock to block the gaps. With the weather finally getting nice again, I went back to trying some testing in the backyard to see what I could get out of the system. Replaced and kept the RA and DEC cables loose from each other. This seems to have helped with guiding. Since the guiding is much better, I figured that PEC would also benefit. It did! Ensure mount is set up correctly, specifically Modulo value was set to 10ms. This was a low enough number and when I looked at the manual program for the curve, I could see that the modulo limited a fair amount of corrections. I also made sure that only the 4 major index for the worm period was defined. Current method was to run the mount at .5 guide rate, capturing at .5 second duration for at least 4 passes of the worm. Then I made a curve and did linear fitting, enabling only the first 4 indexes. This gave a smooth curve. Programed the mount, then did another 4 passes with PEC turned on. This gave a new data set and I used this value to add to the previous curve. This second curve just showed a fine, wavy line less than 1 arc second. The summed curve was then sent to the mount and I did a drift compensation routine. I believe that the critical bit here was the new cable as well as setting an overlap amount of 50%. I think that I may rerun someday with an overlap that is higher. When I tried to save the PEC data from the previous runs, I ran into some issues. The Gemini control panel didn't see the older files so I was not able to load values and rename them. This was really getting annoying as I didn't want to lose the good drifted curves. So I removed the plate off the G2 computer and pulled the SD card. Bringing it onto my computer, I could see the files 20130731_07:30:24.pec and others. The filenames made it impossible to rename or modify because of the colon character. I loaded up the computer with linux and found that the SD card didn't mount because it was unallocated space! This very odd, because windows 7 saw the files just fine afterwards. I may need to reformat the card someday. When I changed the battery, I noticed that many functions on the G2 were snappy and more consistent. We'll see if it remembers PEC data and other settings. I tried to do the backlash exerciser, but it did not want to stop tracking while slewing in DEC. I may try pulling the RA cable and try it again. 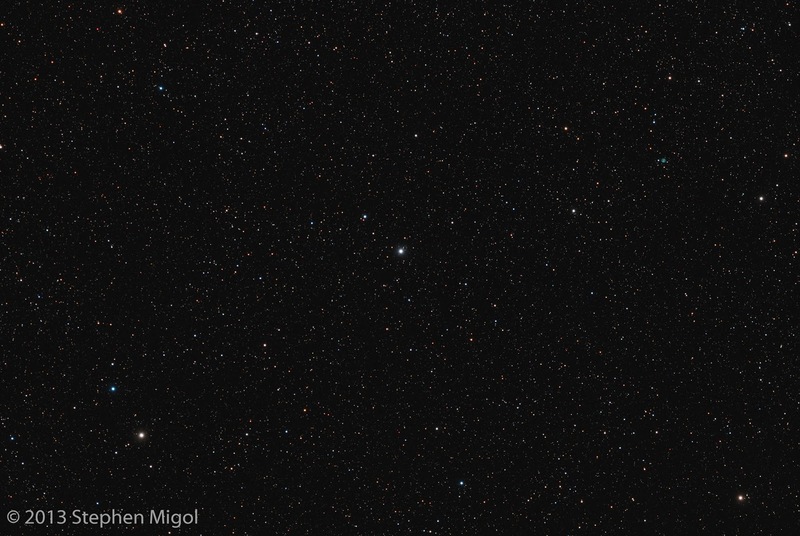 I also want to try getting good focus with the Celestron guider. That's something I can do on a photo tripod. I also want to try using a UV filter on the dslr to see if it reduces the tiny cyan halo on certain stars. Lastly, I should create a reliable, consistent flat method. I played with longer duration flats and didn't see any value. Instead, I saw a color shift towards the brown/reddish color because of the paper used to shift the light.